Do You Have to Be an Expert Surgeon to Make a Good Laparoscopic Surgery Trainer? In the current climate of change in the structure of surgical training and the reduction in trainee hours spent within the operating room, there is more pressure to glean everything from each individual training opportunity. Yet surgical trainees do not always have the luxury of choosing their trainers, and being burdened with a “bad trainer” may hinder their training program. The aim of this study was to determine those attributes that are important to be a good laparoscopic trainer and to make an expert laparoscopic surgeon. Two interviewers performed forty-three semi-structured interviews. Subjects included 29 surgical trainers, 10 senior surgical trainees, and 4 educationalists. The interviews were transcribed by the same interviewers and then using N-VIVO software, analysed by two raters. 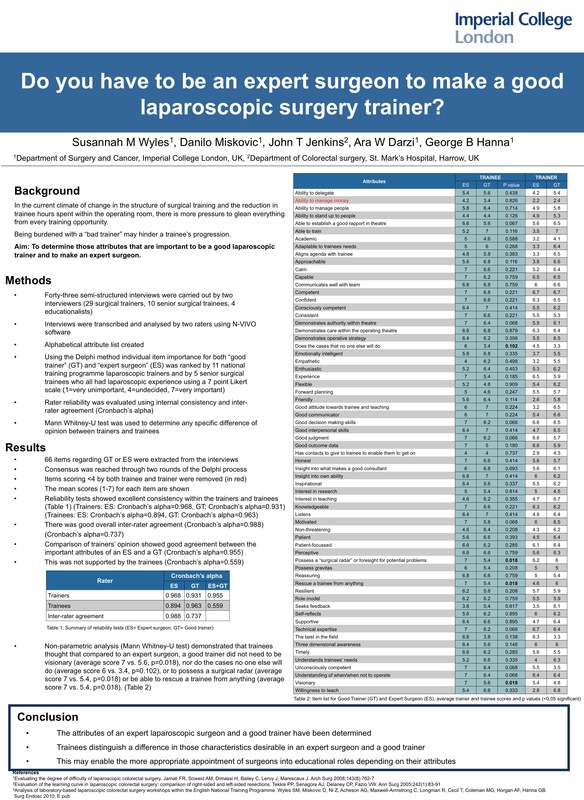 From this analysis, an alphabetical attribute list was created, and using the Delphi method, individual item importance for both “good trainer”(GT) and “expert surgeon” (ES) was ranked by 11 national training program laparoscopic trainers and 5 senior surgical trainees who all had laparoscopic experience, using a 7-point Likert scale (1=very unimportant, 4=undecided, 7=very important). The reliability was evaluated by internal consistency (Cronbach’s alpha) and inter-rater agreement. Mann Whitney-U test was used to determine any specific difference of opinion. Consensus was reached through two rounds of the Delphi process. Sixty-six items regarding good trainer or expert surgeon attributes were extracted from the interviews. Reliability tests showed excellent consistency within the trainers (ES: alpha=0.968, GT: alpha=0.931), and trainees (ES: alpha=0.894, GT: alpha=0.963). There was good overall inter-rater agreement (ES:0.988, GT:0.737). Comparison of trainers’ opinion showed good agreement between the important attributes of an ES and a GT (alpha=0.955). This was not supported by the trainees (alpha=0.559). Detailed analysis demonstrated that trainees felt that compared to an expert surgeon, a good trainer did not need to be visionary (average score 7 vs. 4.82, p=0.018) nor to do the cases no one else will do (average score 6 vs. 3.27, p=0.102), or to be unconsciously competent (average score 7 vs. 3.45, p=0.068). They thought it was very important for a good trainer to be friendly (average score 7 vs. 5.2, p=0.114). Through a Delphi process the attributes of an expert laparoscopic surgeon and a good trainer have been determined. Trainees distinguish a difference in those characteristics desirable in an expert surgeon and a good trainer. This may enable the more appropriate appointment of surgeons into educational roles depending on their attributes.